I had actually tried a more gradual fade earlier but thought it looked awkward on the individual posters, but if you want to go with this thats no problem! Here is the final artwork for app state, its set up to be a 3 color screenprint. Sometimes halftones can display a little strange on screen, but I think this will look killer when printed! With these two old southern universities we thought it could be cool to go for a vintage handbill or ticket look. 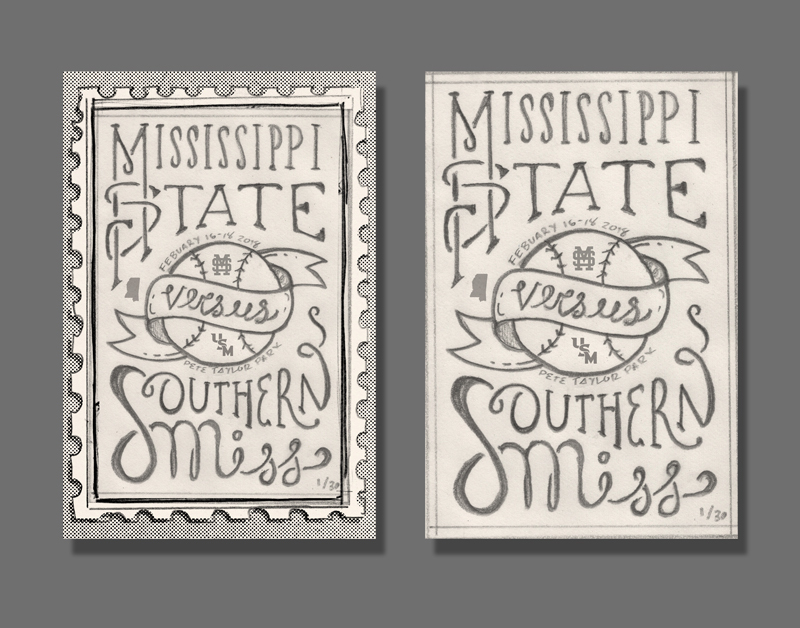 This horizontal sketch allows for the long school names "Mississippi" and "Southern" to be displayed big and prominent. The school mascots appear in their respective corners. Some color was added to this sketch just to see how the colors could be incorporated. This vertical version displays the baseball more prominently but still has the vintage feel and would also use the handdrawn type. 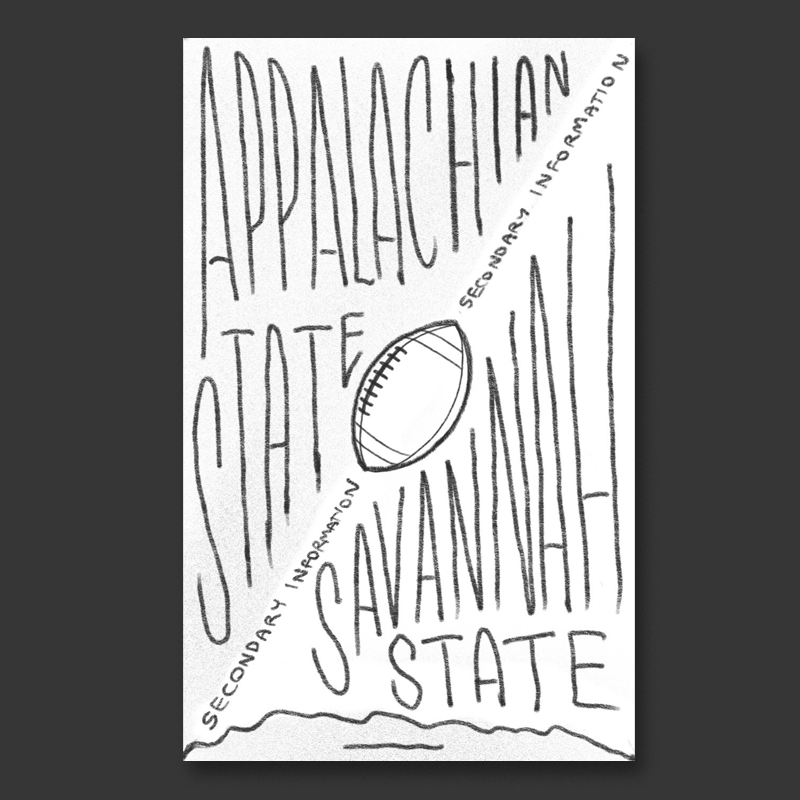 Here are a handful of ideas for the app state posters - I think that a typography-centered approach for these could work really well - inspired by vintage football program covers. Type-heavy stuff is kind of hard to communicate in a sketch but I think any of these will look great fleshed out more. All of these could work on their own or together as a tryptich, most of them could be mixed and matched together and still work. 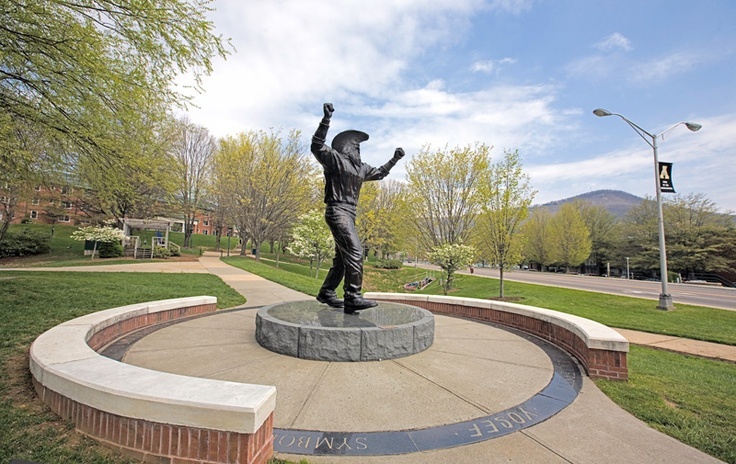 The squiggly looking line at the bottom of all of them will be the silhouette of a mountain range, a reference to the university's location, when you put all 3 posters next to each other the mountains would line up creating a continuous image across the set. For colors I think it makes sense for each print to be black, yellow, and then one color for the opposing team. That way they all work together while still being distinct.